Maldives graduated from the LDC category on January 1, 2011 after a longer than usual transition period. The country met graduation criteria in two successive triennial reviews (2001 and 2004) on the basis of its high GNI per capita and human assets index (HAI). CDP recommended the country’s graduation in 2004, and the recommendation was endorsed by the ECOSOC Council. Graduation was originally scheduled to take place three years later. However, following the devastation caused by the Indian Ocean tsunami of 26 December 2004, the UN Assembly decided to defer the commencement of the three year period preceding graduation to January 1, 2008, thus pushing the country’s graduation to January 1, 2011. In anticipation of the need to adjust to changes in development and trading partners’ support, the UN recommended the Government to adopt several smooth transition policies to avoid any possible disruption in its development progress. In this regard, the Maldives Donor Forum was held in 28-29 March 2010, in which the Government introduced the challenges it faces and the measures it has taken to its development partners. It also presented five priority areas—macroeconomic reform, public sector reform, social development, governance, and climate change—which require external resources to ensure positive outcomes. GNI per capita in 2018 was $3,161 using the World Bank Atlas method, well above the income graduation threshold, while the HAI was far above the graduation threshold. These achievements reflect the implementation of effective policies, support by the international community, and the strong commitment to social development by the Government. Drive west round the ring road from Port Vila, Vanuatu’s capital, and you pass some warehouses near the airport. After some outlying villages overlooking the beach, a steep grind over the hill takes you to Havannah harbour and a cluster of fancy resorts. At the north of the island you might pass women in pick-up trucks carrying fruit and vegetables to market. More resorts follow. The trip, mostly on smooth asphalt, takes a couple of hours depending on how long you stop to gaze at the ocean. The revolution wrought by the ring road is part of a long-term economic boom. Driven by tourism and real estate investment, income per head in the Pacific island state rose by over 2.5 times in real terms in the 15 years from 2002 onwards. The economy bounced back from cyclone Pam in 2015, paving the way for graduation in 2020. At about $3,000, Vanuatu’s per-capita GNI is more than double the LDC threshold making the country eligible for graduation based on this criterion alone. But, in addition, Vanuatu’s Human Asset Index (HAI) is well above the LDC threshold. Vanuatu’s main problem is its economic vulnerability, as measured by the EVI, which stems primarily from its remoteness and exposure to natural disasters. Vanuatu ranks as one of the highest disaster-prone countries in the world due to its location in the Pacific Rim of Fire and the Pacific Cyclone Belt. Cyclone Pam is one example of the vulnerabilities that will continue to affect the island state as its coastal areas continue to be hit by climate change. LDC status has allowed Vanuatu to benefit significantly from the preferential trade terms extended by developed countries. In this sense, graduation poses a challenge because Vanuatu’s main exports, such as fish and coffee, beef, kava, copra and cocoa, are likely to face higher tariffs in key exports markets such as Japan, where exports of boneless beef and certain types of fish would face tariffs of 38.5 per cent and 3.5 per cent, respectively, on the basis of the current tariff schedule. Graduation could also bring unintended consequences in the form of withdrawal of access to concessional finance. In preparation for graduation, the Government of Vanuatu has established a National Coordinating Committee that will formulate strategies and policy interventions to address the possible negative impact of graduation. The government is working in close collaboration with development partners and UN agencies on building a resilient and sustainable economy and to deal with unforeseen natural disasters and economic shocks. To strengthen the economy and increase productive capacity the government has given priority to infrastructure investments that support its two main economic activities: tourism and construction. To reduce economic vulnerability, the Government will work with international donors including the UN system, development partners, and financial institutions to ensure that financial aid, insurance coverage, and humanitarian help are readily in place before and immediately after natural disasters occur. In many ways Vanuatu’s experience typifies the LDC story. Until 2017 only five had left the category since its formation in the early 1970s – Botswana in 1994, then in recent years Cape Verde, the Maldives and Samoa. Higher oil prices in recent years have meant Equatorial Guinea left the category in 2017, followed by Angola and Vanuatu in 2020 and 2021. Several more were likely to follow shortly after, having met two of the criteria for the first time in 2015 at the most recent triennial review of the UN Committee for Development Policy (CDP), the body which monitors the category and makes recommendations on Least Developed Country (LDC) graduation. While the economic and human development successes of LDCs are testament to the work of government policymakers and businesses in conjunction with donors (Vanuatu’s ring road was built with grant assistance from the United States), the UN has played a vital role. The UN Office of the High Representative for The Least Developed Countries, Landlocked Developing Countries and Small Island Developing States (UNOHRLLS) launched and helped promote the LDC programmes of action. The recent mid-term review of the Istanbul Programme (IPoA) among other things urged official donors to recommit to their target of sending aid worth 0.15% to 0.2% of gross national income to LDCs, and to continue promoting LDC trade and investment. UNOHRLLS has helped integrate many IPoA targets into the sustainable development goals (SDGs), including those on doubling the LDC share of global trade and raising productive capacity. Behind the scenes, UNOHRLLS has also conducted inter-governmental work, promoting LDC issues at the UN. Partly as a result of this work and at the UN Conference on Trade and Development, LDC trade, investment and aid receive more global attention than ever before. A range of international support measures are offered by the UN system. Cabo Verde graduated from LDC status on 20 December 2007. In preparation for its graduation, the Government set up a donor support group called GAT to prepare a transition strategy to adjust to the eventual phasing out of the support measures associated with LDC membership. In June 2007, GAT adopted a declaration supporting Cabo Verde’s socioeconomic transformation agenda. Additionally, a budget support group (BSG) composed by the Government and participating multilateral and bilateral donors was created in 2005 to align and harmonize donor support around the Growth and Poverty Reduction Strategy. Cabo Verde smooth transition strategy is here (en Français). Samoa graduated from LDC status in January 2014 after meeting GNI and HAI criteria in 2003 and 2006. On this basis, UN’s CDP (Committee for Development Policy) recommended that graduation took place in January 2010, but the Government of Samoa requested deferral after the tsunami of 29 September 2009. Also, in 2011, Samoa joined the World Trade Organization (WTO). In accordance with UN resolutions, Samoa began working on a smooth transition strategy plan in 2009. In 2011, it agreed with its DPs (development partners) on a Joint Policy Matrix, which became the basis for the delivery of aid once graduation became effective. The MFIs (multilateral financial institutions) confirmed that there would be no change to Samoa’s ability to access concessional financing provided it complied with the policy matrix. Likewise, the bilateral partners indicated their commitment, and Samoa continued to see an increase in aid volumes up to the present. The UN assisted through the conduct of impact assessments and a program for the accelerated achievement of the MDGs (Millennial Development Goals) through a policy review that contributed to the 2012-2016 national development strategy for sustainable development. To prevent the abrupt loss of preferential market access under the DFQF (duty-free, quota-free) arrangement granted to LDCs, the government negotiated with some of its export partners including the USA and Japan the continuation of DFQF schemes beyond graduation. Under Everything but Arms, a transitional period of three years was allowed after graduation for access of Samoa’s exports to the EU market. In addition, Samoa continues to receive preferential bilateral market access to Australia and New Zealand. In terms of access to concessional loan financing, in the case of the World Bank and ADB (Asian Development Bank), what was lost as an LDC can still be accessed as a small island developing state. Because of Samoa’s classification as a country at high risk of debt distress by the IMF, the government has continued with ongoing reforms including the implementation of a medium-term debt strategy. Given the high level of the public debt, the government was able to secure 100 percent grant financing for reconstruction after cyclones and other natural disasters. At the same time, considerable efforts have gone into improving revenue collection. 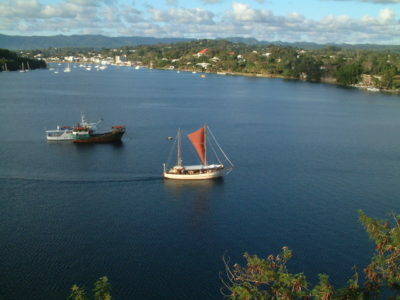 As a small island developing state (SIDS) that faces severe and permanent economic and environmental challenges, Samoa has been actively engaged with the international community and in constant dialogue with its development partners to ensure that any LDC-specific concessions lost as a result of graduation could legitimately be retained on SIDS-specific grounds. Samoa’s 2015 smooth transition strategy can be found here. Samoa’s 2014 smooth transition strategy is here. Daniel Gay, Inter-Regional adviser with the Committee for Development Policy, presents the case of Vanuatu’s LDC graduation, which can be seen as a long-term success story. Committee for Development Policy member Leticia Merino talks about the importance of human development and environmental sustainability, as well as the need to involve civil society in the graduation process. Committee for Development Policy member Diane Elson talks about how LDC graduation is about more than income per capita, and how environmental sustainability and equality need not come at the cost of economic growth.